At the end of the previous evening Andy had given us the keys to their black VW SUV, which he had parked on the street for our convenience. After our second day with them Andrea and Mila had flown to Arizona for a quick birthday celebration with her family, so at this point their second car was not being used and thus was available to us. Since it was a Monday, Andy had to work, so we were set to make our way to South Bend and back on our own. We began, as usual, with breakfast at Ray’s. By now we knew the drill, however, so we wisely split an entree. It was still plenty for the two of us. We then walked down the street to Andy’s, hopped in the car, and took a look at routing options on Nancy’s iPad. As we had guessed, the freeway, an onramp to which was only blocks away, was full of commuters heading into downtown Chicago. Nancy suggested Wacker Drive as a scenic alternative, but having ridden along it with Andy over the previous two days I nixed that idea: Chicago drivers are a bit crazy and Wacker Drive seems, well, “whacked”; I didn’t want to risk Andy’s relatively new SUV driving through such a busy and (to me) confusing part of town. Instead, I opted for a slightly more roundabout route that, although it ran through a very working-class (and thus not very scenic) part of town, took me to the freeway beyond where the iPad indicated that there was traffic. With the route set, we headed out on what proved to be a very smooth and uneventful drive. I was extremely thankful that Andy had an E-Z Pass to allow me to fly though the tollbooths without having to stop and wait for change; Indiana in particular seems to be enamored of toll roads. I also was careful to watch for and obey the speed limit signs. The speed limit varied quite a bit, often for no discernible reason, and we observed quite a few Highway Patrol officers along the way. I made good use of the cruise control to ensure that my speed wouldn’t attract any attention. The route we followed was extremely straightforward: interstates all the way. We retraced some of our steps from the previous day, but of course didn’t go nearly as far. From Andy’s place in Chicago, South Bend was only about an hour and forty-five minutes away, taking us through scenic (not) Gary, Indiana. I didn’t realize that Gary has an “International Airport.” Curious, I looked it up: like the city, the airport has fallen on hard times. There is currently only one commercial flight out of Gary, to Orlando, Florida, and it only flies two days a week. But for a Chicagoan, perhaps it is a cheaper way to get to Disney World, as long as they can live with the limited service. As we drove, Nancy kept Mark apprised of our progress so that he would know when to expect us. We had arranged to meet Mark at his apartment, so we headed directly there. It was just off campus, and although the route we took carried us along the edge of Notre Dame (and Saint Mary’s), we saw surprisingly little of either school. Shortly after we parked, Mark emerged from his apartment, and he sure seemed happy to see us. Perhaps it was us, but some of his enthusiasm may have been due to the fact that he had been studying for finals, and welcomed the break. Knowing that only his final exams stood between him and his Master’s degree, we knew that, as with Kevin, this would be a relatively short visit. But at least Mark had time to eat lunch with us, after giving us a brief campus tour. 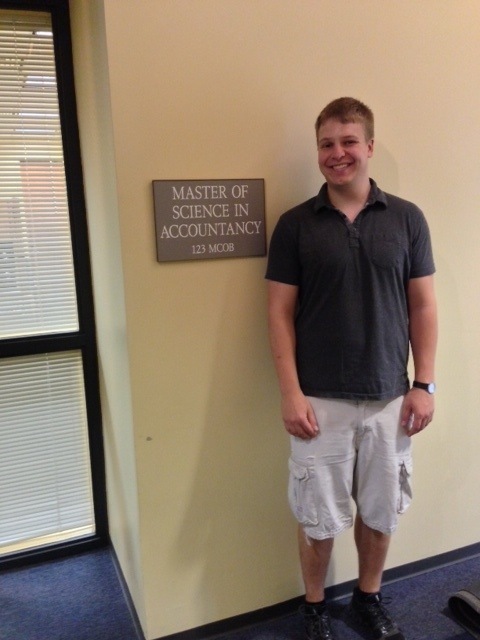 Mark showed us his world, which is surprisingly small but makes sense given that all of his classes were in the business building: he is finishing up a Master of Science in Accountancy degree. Thus, other than that building and the gym, he really didn’t have much reason to go into other parts of the campus. We followed his daily “commute,” which was a pretty straight line from his apartment, along the football stadium, to the business building. On our “tour” we only went into the campus bookstore (which is nice, but isn’t much different from anyone else’s), the business building, and the chapel (just for a peek). The business building is mostly just classes and study areas; about what you’d expect. The one interesting thing we came across in the building was a very old stock market trading desk. 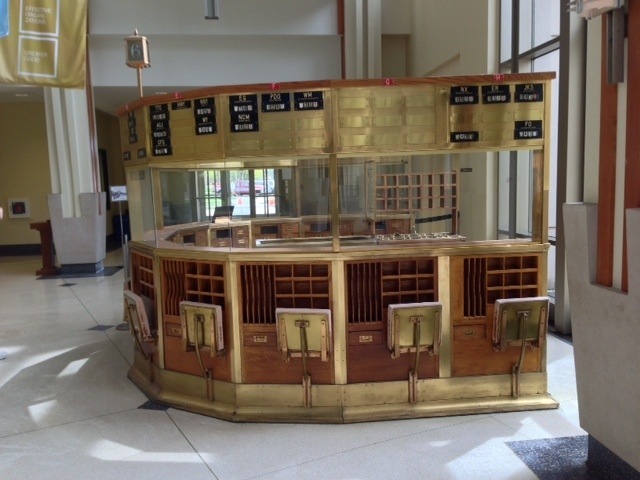 It was made of wood and looked a bit like a multi-window ticket counter, with a flip-down seat at each window for the traders and hand-operated mechanical number displays to show the various stock prices. We also checked out “the Grotto,” which is a beautiful outdoor shrine built to look like a stone cave with kneeling rails in front. The flickering of the hundreds of votive candles and the silence being observed by everyone in the area gave the space a particularly spiritual feel. We sat on a bench and lingered for a few moments, enjoying the peace and taking time to say a few prayers for our loved ones back home and elsewhere. Finally, we headed off to what appears to be a relatively new shopping and dining area right at the edge of campus. Mark was taking us to lunch at “The Mark” (he loves the name, naturally), an upscale bar-and-grill at which he has reservations following his graduation later this month. The place was doing a good lunch business, but by agreeing to sit in the bar area (at a table) we were seated right away. The food was great, and the company even better. It was again a great opportunity to get to know one of our nephews as an adult, rather than as one of the mob we see when the larger family gets together from time-to-time. After that, it was time for Mark to return to his studies, so we walked back to his apartment complex where Mark returned to his apartment and we returned to our borrowed car. The drive back to Chicago was smooth and uneventful, and since it was still early in the afternoon when we got back we didn’t have to play any traffic games but instead stayed on the interstate all the way back to within a couple of blocks of Andy and Andrea’s apartment (and our B&B). The early hour also meant that we could park the car in front of their apartment, leaving their one-car garage free for their other car. Around 5:30pm Andy texted us to let us know he was back home, so we walked over to his apartment for our next adventure. After we had dropped Andrea and Mila off at Midway airport, Andy had given us a driving tour of some Chicago highlights. As we were driving around, talking, it occurred to us that we had never been to Wrigley Field, a true Chicago icon. Later that evening we had looked, and sure enough, the Cubs were in town and playing. The evening after our drive to South Bend the Cubs were playing a makeup game with the Texas Rangers (apparently, the original game had been called on account of it being too cold!). It being a makeup game, and a Monday evening, added to the fact that the Cubs aren’t playing too well right now, there were plenty of tickets available, and at good prices. Thus, armed with three tickets purchased online, we walked from Andy’s apartment to the commercial district, where we’d be much more likely to hail a cab: it seems that cab fare is cheaper (and much less of a hassle) than parking at Wrigley. 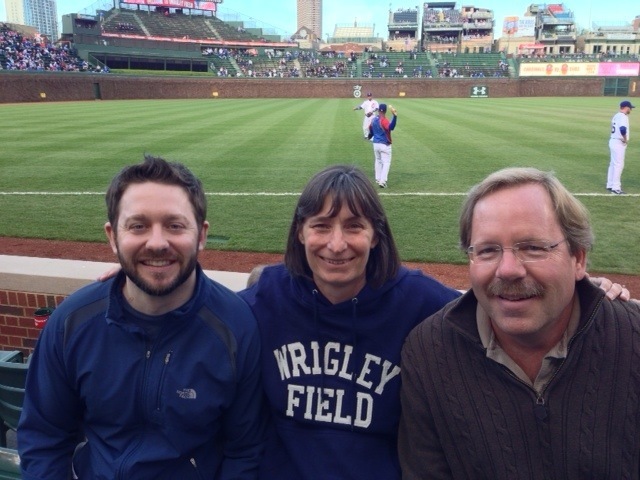 We eventually did manage to hail one–a pretty beat-up old Crown Victoria that somehow got us to our destination–and shortly found ourselves staring up at the iconic red Wrigley Field sign outside of the stadium. We had set out fairly early, and so we arrived at the park with plenty of time to spare. Rather than go in we elected to burn some of our spare time by participating in that great American pastime: shopping! Nancy wanted a Wrigley t-shirt or sweatshirt, so we perused the wares offered by a number of shops and street vendors and after some back-and-forth, amazed at the fairly high prices we were seeing, Nancy settled on a simple blue sweatshirt with sewn-on white letters spelling out “Wrigley Field.” With that settled, we entered the park and found our way to our seats. Which turned out to be great! Our seats were in the third row, along the third-base line, a little way beyond third base. The bullpen was set up right in front of us, so we were just three rows behind the relief pitchers and had a clear view of them when they were warming up. We also got to see a lot of third-base action, fairly close-up. It was hard to judge the quality of the pitches that were being delivered to home plate, but we didn’t care. We drank “Old Style” beer (it’s the thing to do at Wrigley, I’m told) and ate Chicago dogs and Crackerjacks. The weather cooperated beautifully, providing us with a clear, slightly cool evening. The stands weren’t even half full, but it felt to me like I was watching baseball as it was meant to be played, in one of the last old-style parks. Wrigley doesn’t have a Jumbotron, and we always turned our attention to the main scoreboard whenever anyone made it to home plate, since the scores are put up the old-fashioned way: by a person inside the scoreboard removing the card containing the old numeral and replacing it with a new one. And, strangely enough for the Cubs (or so I am told), this happened a lot. 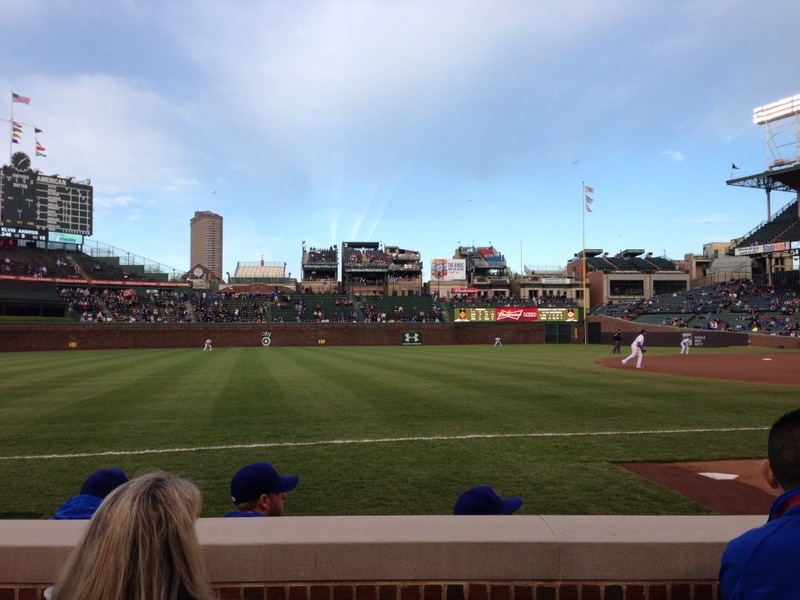 The Chicago Cubs managed to beat the Texas Rangers by a score of 9 to 2! Unfortunately, from what we heard and later read in the local paper, the current owner is trying to upgrade the park, adding screens, amusements, a high-tech scoreboard, and the like. In addition, Wrigley has very few outfield bleachers, so the buildings beyond the outfield have an excellent view right into the park. Because of this, stands have been erected on those building rooftops and the buildings have been turned into upscale seating and dining establishments for well-heeled fans. The owners of these buildings apparently have long-term contracts that guarantee them an unobstructed view, but the team owner is trying to void those contracts so that he can add more seats, or amusement park rides, or something, in the outfield. It sounds like a mess, and it sounds like the city of Chicago isn’t excited about this new direction. It’ll be interesting to see how it plays out. I’m definitely with Chicago on this one; I’d very much like to see the park stay as it is. There was no problem flagging down a taxi after the game, so it wasn’t long before we were back “home,” saying goodbye to Andy as we would be heading to the train station the next morning while he was at work. Before heading off to breakfast that next morning we took advantage of Ray’s laundry facilities, so that we wouldn’t have to worry about running out of clean clothes for a while. By 11:00 our taxi was waiting outside, and we headed off to the Chicago station for (what we thought) was a 2:00pm departure. As you might guess, we were wrong about that…but I’ll go into that next time. 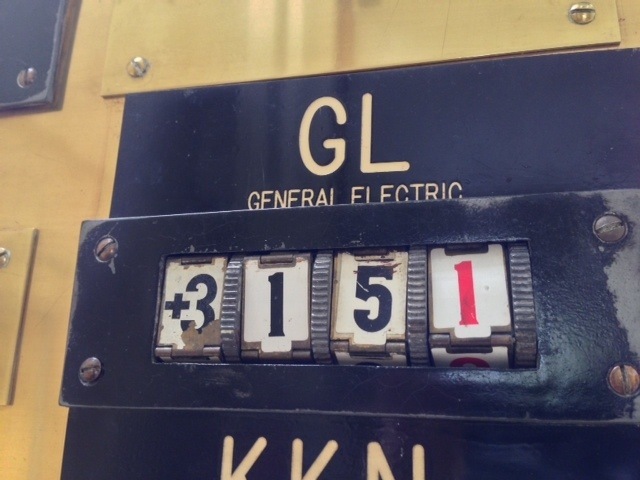 This entry was posted in An Amtrak Grand Tour on May 13, 2013 by Greg Wilson.